In early 1936 as the Great Depression raged, the Works Progress Administration (WPA) undertook what many would call a "make-work" project to build a lodge on the south side of Mt. Hood in Northern Oregon. In retrospect, history has shown us that the Timberline Lodge was a "make-art" project-- the Timberline Lodge is certainly a state, if not national, treasure! The original design of the building was created by the famous architect, Gilbert Stanley Underwood, and although his design was heavily modified prior to construction, his influence is apparent. The architectural style is unique, a blend of many styles really. It primarily reflects the rustic style, a style which Underwood had undeniably mastered by this time. The Lodge features the classic rustic elements: high ceilings, massive exposed beams and posts, heavy metal accents (wrought iron in this case), and large expanses of rough-cut stones. The "Timberline Arch", a structure named after this lodge, is a major repeating theme; seen in doors, windows, and even the furniture. Timberline Lodge is listed as a National Historic Landmark. 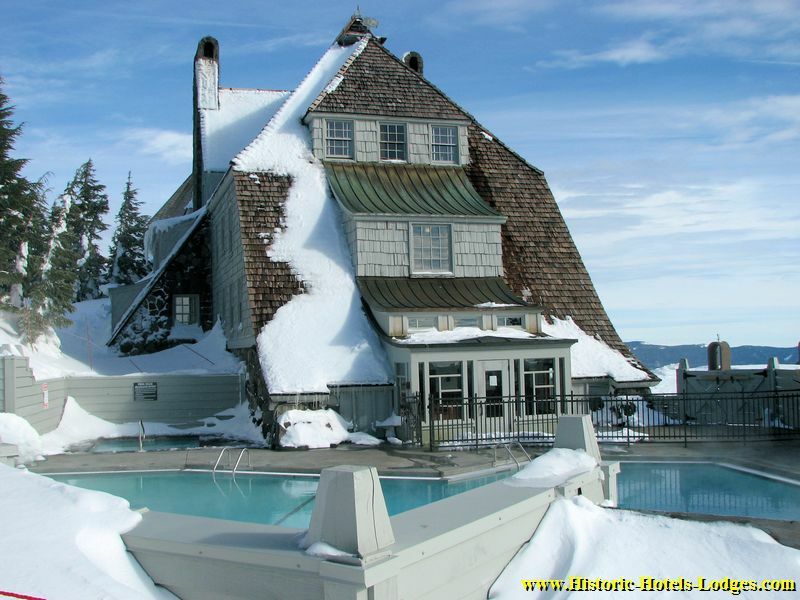 Timberline Lodge, which opened September 28, 1937, is a hand-made wonder. Just about everything in the building from door hinges to furniture is hand-made, mostly from local materials. Crafts persons were brought in to design and build models of the furniture, rugs, drapes, and bedspreads. Those crafts persons then trained unskilled workers who did the bulk of the work of making the furnishings. Interior designer Margery Hoffman Smith was the interior designer for the Lodge. Artisans were hired to create original art work for the lodge that ranged from wood carvings to paintings. Today the Timberline Lodge is an art museum as well as a lodge. In addition to the original pieces from the 1930's, additional art work has been commissioned and added to the building over the years. Items that wear out, such as the drapes, have been repaired or replaced with new hand-made duplicates of the originals. When items needed to be modernized to meet modern-day requirements, such as door locks, the work has been done in a way that makes the modern mechanism appear as close as possible to the original. Timberline Lodge is a showplace of superb craftsmanship, both old and new. Photos were taken February 13-15, 2008 unless noted otherwise. Welcome to Timberline Lodge in the Cascade Mountains of Northern Oregon! 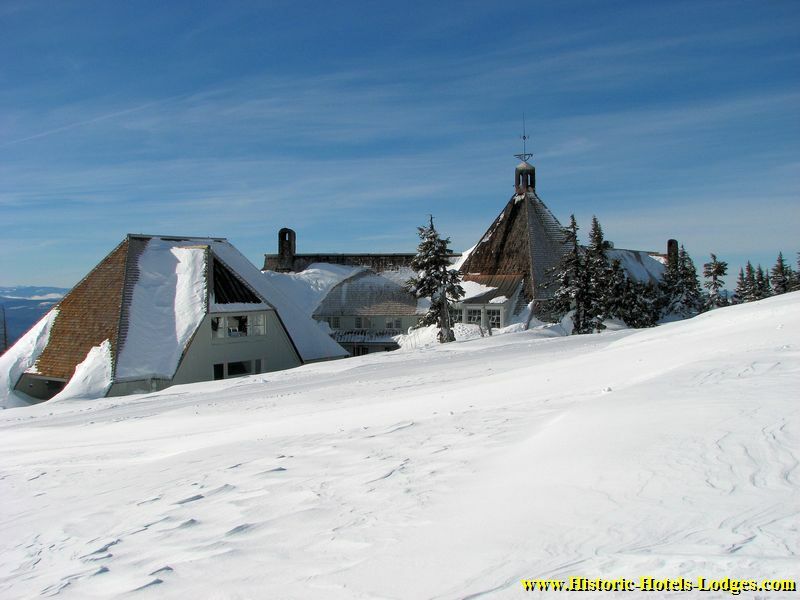 As you can see, it was winter when this photo of the Timberline Lodge was taken and there is a lot of snow up here! But this is a ski lodge, so that's a good thing. That huge mountain on the right side is Mt. Hood topping out at 11,249 feet high. The Lodge is perched on the south flank of Mt. Hood just above the tree line at around 6,000 feet. 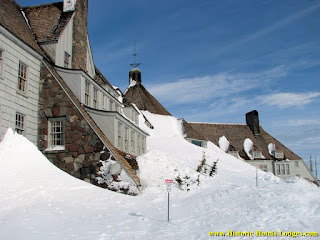 Timberline Lodge was built in 1936-1937 during the Great Depression. It was a Works Progress Administration (WPA) project, intended to create jobs for unemployed workers. The construction involved building the structure, creating parking lots, and building a suitable road to the Lodge. But at Timberline they went a lot further, WPA workers also hand-built all the furniture for the Lodge, made all the drapes and linens, commissioned original art work to decorate it, and did almost all of it using local unemployed laborers! One more thing-- almost all of it was hand-crafted using hand tools and traditional methods. Timberline Lodge was declared a National Landmark in 1978. Does the building look familiar? 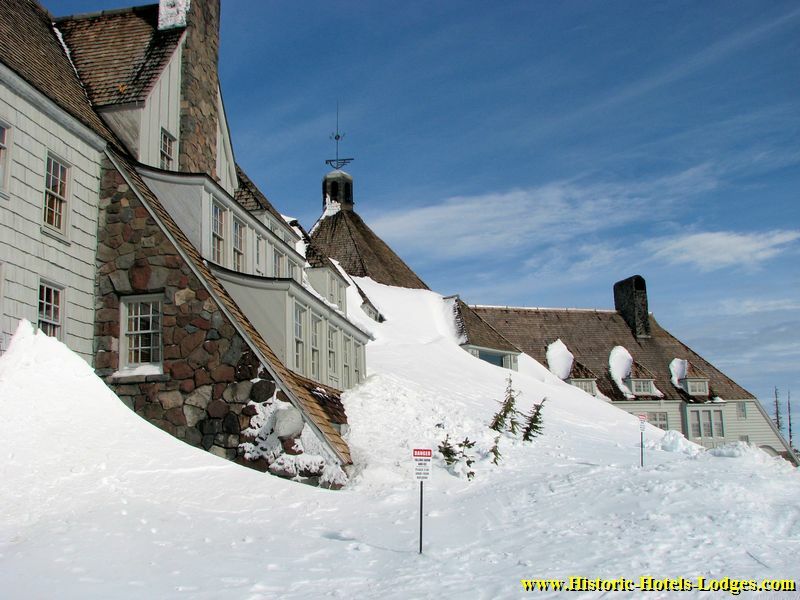 The Timberline Lodge's exterior is featured in the famous 1980 movie The Shining. This is a view from uphill on the east side and, wow, as you can see there is really a lot of snow! The first two floors are completely buried below the snow level. 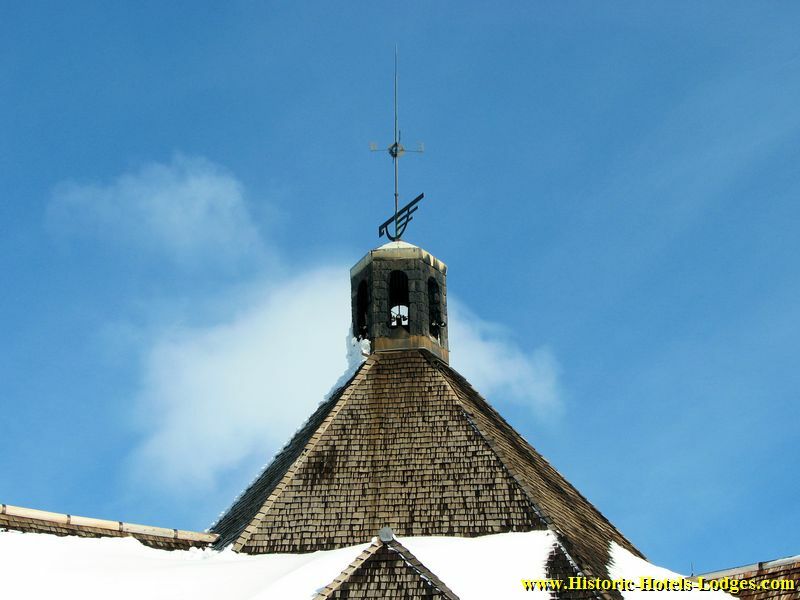 The Timberline Lodge was dedicated on September 28, 1937 by President Franklin D. Roosevelt in person. The Lodge wasn't completely finished at the time, so they hastily put on enough finishing touches to make it presentable, and the dedication went forward on schedule. The dedication of the Timberline, built in record time of less than 2 years, was a big deal for the New Deal. This project was a symbol of recovery for a nation weary of recession. Timberline Lodge opened to the public in February of 1938. Unfortunately the economy was still in bad shape and the lodge struggled to make enough money to stay open. The lodge fell into disrepair and finally closed during World War II. After the war Timberline saw a reversal of fortune and great revival under its new manager, Richard Kohnstamm. Mr. Kohnstamm's vision for Timberline continues today with his son Jeff, who is now president of the RLK Company. RLK is one of 3 organizations that work together to make the Timberline Lodge what it is today. The U.S. Forest Service owns the lodge and administers everything, while a non-profit organization called "Friends of Timberline" raises the money and labor to restore and maintain the Lodge. The RLK Company manages the day-to-day operations of the Lodge and Timberline Ski Area. The focal point of the Timberline Lodge is the Head House in the center of the building. The head house is a hexagonal structure (6 sides) with a huge hexagonal stone chimney in the center of it. The pyramid shaped roof of the Head House rises above the roof of the adjacent wings. The Head House is topped by a 750 pound bronze weathervane, which features the Timberline Logo (the logo rotates to point in the wind direction). Above the logo is a fixed compass. What appear to be windows just below the weathervane in this photo are the chimney flue openings where the smoke comes out. The tall, steep roofs of the Lodge are intended to mimic the surrounding mountains, and the pyramidal form of the Head House roof obviously is a reflection of Mt. Hood. At the west end of the building is the swimming pool and spa. They are open year-round, and yes, the pool is heated. 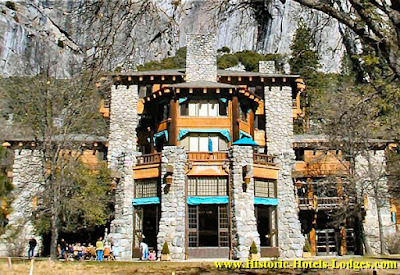 The conceptual design of the Lodge was done by Stanley Gilbert Underwood, who was already well-known for his rustic but elegant hotel designs (the Ahwahnee in Yosemite, Bryce Canyon Lodge, the Grand Canyon Lodge on the North Rim.) The actual building plans for the lodge were drawn by a team of local National Forest Service architects; Tim Turner, Linn Forest, Howard Gifford, and Dean Wright. This was in keeping with the general premise that the Lodge would be a showcase for the Northwest, built with local materials, using local workers, local artisans, local architectural styles, and logically, local architects. What resulted was a final design roughly based on Underwood's conceptual design with a number of major changes to give it a more refined, less rustic look. The name "Cascadian" was created by the architectural team to describe the new architectural style of the Lodge. If you are a fan of Mr. Underwood's work (as I am) don't panic, despite his minimal involvement, anyone familiar with his work will see his influence here. The location of the lodge was selected and designed by engineer Ward Gano, Linn A. Forrest, FAIA, and landscape architect Emmett Blanchfield. Blanchfield also designed the surrounding landscape features; patios, terraces, walk ways, etc.. Unfortunately, most of the landscape he designed was never installed. The Timberline Lodge Layout: Timberline Lodge consists of the pyramid-roofed Head House and 3 wings that radiate out from the Head House. There is a Ground Floor, 1st Floor, 2nd Floor, and 3rd Floor-- for a total of 4 floors, plus a small "basement" area on the east end where the accessible entrance and loading docks are. The Head House is the center "hub" of the Lodge and right in the center of it is a huge rock chimney with multiple fireplaces. It is the location of the common areas of the lodge, on the ground floor is a lobby, the main lounge is on the 1st floor, a balcony lounge is on the 2nd floor. The Head House is also the location of the main stairs and elevator. The West Wing, on the left in the photo above, is 4 floors; the ground floor holds the gifts shop, front desk, a few offices, and the "Chalet" guest rooms. The upper 3 floors are guest rooms, including the suites with fireplaces. The East Wing is 3 floors and angles out on the right in the photo above. The ground floor of the east wing contains the Barlow Room, and support facilities. On the first floor are the Cascade Dining Room and kitchen. The 2nd floor is guest rooms. The C.S Price Wing is on the rear, not visible in the photo above. It was added to the Lodge in 1975. It contains support facilities and offices, with meeting rooms on the 1st and 2nd floors.